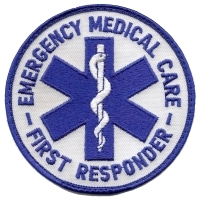 All members of the Osseo Fire Department are trained in emergency medical care to at least the level of first responder, and many are trained to the level of EMT or beyond. This includes basic life support, CPR, automated external defibrillation, cardiac management, spinal stabilization, first aid, and more. If there is a medical emergency we are often first on scene or soon after the on-duty police officer. In early 2006, the department purchased and assembled Vials for Life--small orange bottles resembling prescription drug bottles affixed with a recognizable sticker and filled with a refrigerator magnet and medical information forms. We walked the streets and handed them out to every resident in town. Residents were instructed to fill out the medical information forms, put them back in the bottle, put the bottle in either their fridge or freezer, and then to place the magnet on the door of either the fridge or freezer. That way, in the case of a medical emergency, even if no family members were present, emergency responders would have easy access to vital information about conditions, prescriptions, providers, contacts, etc. The program was well-received by the community and we have taken advantage of them on multiple occasions.